Mother's Day is this coming Sunday, and to celebrate I'm posting kid friendly recipes all week. I may be alone in this, but sometimes I have trouble figuring out different healthy(ish) options to serve my toddler, especially easy lunch recipes, and my idea of celebrating mothers is to have five new easy recipe options. Happy Mother's Day! Frozen bananas are about the easiest frozen treat you can make, but they are so satisfying and so delicious. Somehow frozen bananas taste even better to me than regular bananas, though I can never figure out why. A lot of times in our house I'll just slice up a banana, wrap it in saran wrap, and freeze it for a snack. My daughter calls it "cold 'nana" (we are crazy original over here) and goes nuts for them. Of course the only way to improve on such a healthy snack would be to cover it in chocolate, right? 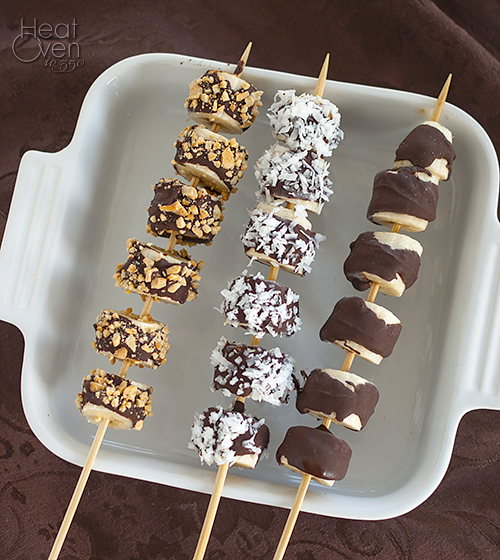 And I probably don't have to tell you that as tasty as frozen bananas are, chocolate dipped ones are even more delicious. The great part is, they are easy and fast to make. 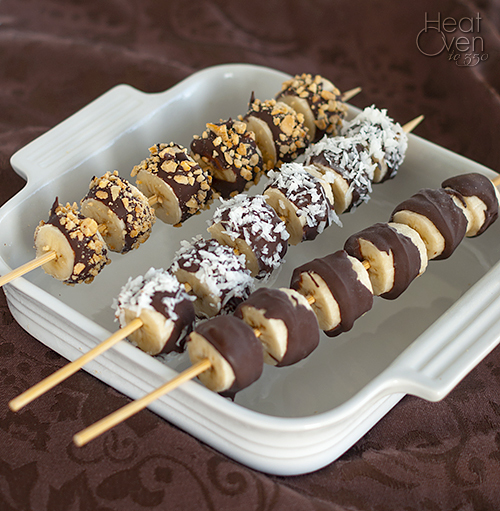 I like to cut my bananas in slices and put them on skewers for easier dipping/serving versus leaving the banana whole. If you have older kids they could help dip and top with chopped nuts, coconut or any other topping you like. I love that the banana bites satisfy the need for something sweet or a frozen treat while being filling and relatively low fat. Peel the bananas and cut into 1 to 1 1/2 inch thick slices. Slide slices onto wooden skewers. What a great idea!! I love it - I may need to bring this to my Mom's on Sunday. Hope everyone is adjusting to the new baby and you are getting some sleep! Those are looking like a lot of fun! It's nice to make something special from something so simple.